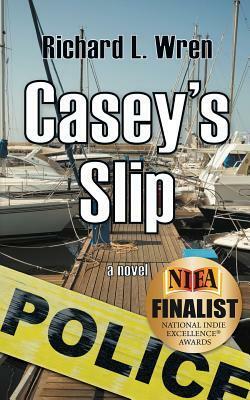 Casey's Slip a finalist for national book award! Oakland, California- June 2014 - The National Indie Excellence Book Awards for 2014 have been announced, and Richard L. Wren's first novel, CASEY'S SLIP, made the short list for finalists in the Action/Adventure category. "The National Indie Excellence® Awards (NIEA) was created to help establish self-publishing as a proud, legitimate, and strong facet of the publishing industry." http://www.indieexcellence.com/index.html for more information about the awards. "I'm really excited that Casey made the finalist list," said Wren, "especially since I know that there were so many books submitted for competition. Put that together with the possible movie adaptation and the book may yet slip into prominence. "This announcement is on the coattails of the move to include brick-and-mortar bookstores, as well as online booksellers, for CASEY'S SLIP.If you haven't read CASEY'S SLIP, now's the time! Please pass this along to all your friends and share it on social media! CASEY'S SLIP and Richard L. Wren's second adventure novel JOSHUA'S REVENGE are both available through Amazon.com and bookstores across the nation.